What is the mesenchymal-epithelial transition? During development, the transitioning of epithelial cells to a mesenchymal lineage is not an irreversible process. Instead, a number of developmental programs are accompanied by a reversal of EMT, during which the mesenchyme gets dedifferentiated into the epithelial lineage through a series of molecular events, known as mesenchymal to epithelial transition (MET). This involves morphological changes such as cell polarization and establishment of cell-cell contacts, which are accompanied by changes in the activities of several transcriptional factors that regulate the expression levels of epithelial vs mesenchymal cell markers and signaling molecules. As well as its occurrence during embryonic developmental programs, MET has been observed during reprogramming of somatic cells into induced pluripotent stem cells and in disease states such as fibrosis, inflammation, and cancers . Armed with an enhanced understanding of the molecular basis of MET, recent research in the field of regenerative medicine has exploited MET as the chief intermediary step in the generation of induced pluripotent stem cells (iPSCs) from mesenchymal cells . In response to signals arising from the ureteric bud, the metanephric mesenchyme (MM) surrounding the UB condense around the tips of nascent ureteric branches to form the cap mesemchyme (CM). 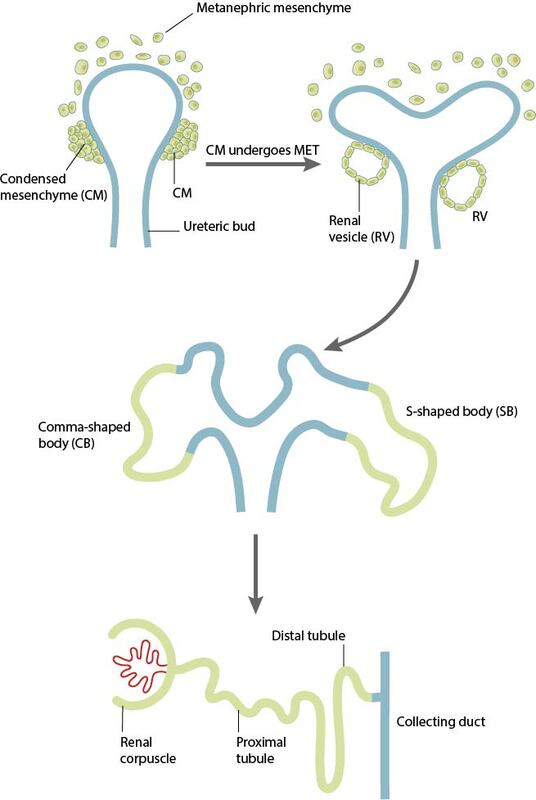 The CM, which is observed to a self-renewing progenitor cell population, starts undergoing a progressive mesenchymal-epithelial transition (MET) that leads to the formation of an epithelial renal vesicle (RV). THE RVs are the precursors to functional nephrons, as they twist and elongate into tightly patterned and segmented tubules (forming comma-shaped and S-shaped intermediary bodies) that remain fused with the ureteric branches to form contiguous tubules with the collecting ducts. Although most organs develop from epithelial tissue during embryogenesis, there are also instances when certain tissue, such as the epithelia of the genitourinary system, peritoneal membranes, and Drosophila midgut are derived from mesenchymal tissue . The development of the mammalian kidney tubules is a classic example of a morphogenetic event that involves the conversion of metanephric mesenchymal cells into epithelial cells that line the nephrons . The mammalian nephric system is one of the most complex organ systems to be formed during embryogenesis and involves the interdependent development of two major components: the ureteric bud and the metanephric mesenchyme. The formation of the adult kidney starts off with the sprouting up of a pair of epithelial buds, called ureteric buds, from the nephric or the Wolffian duct in response to signals from the metanephric mesenchyme. The ureteric buds proliferate and frequently branch-off, evolving into a complex network of tubules called the collecting ducts that invade into the metanephric mesenchyme. During this process of extensive branching, the metanephric mesenchyme responds to reciprocal inductive signals from the ureteric bud by condensing at the tips of ureteric branches, and start expressing epithelial cell markers such as cadherins and extracellular matrix proteins such as collagen IV and laminin. These epithelial cells derived from MET form structures called renal vesicles that ultimately fuse with the ureteric ducts to form the functional nephrons. Studies have linked failure of MET during kidney development with the occurrence of Wilm’s tumor, a malignancy of kidney cells . As detailed above, coordinated, reciprocal inductive interactions between the ureteric bud and metanephric mesenchyme are needed for cell specification into a nephric lineage and early kidney development. For example, the formation of the ureteric bud and its branching morphology is spatially and temporally regulated by signals arising from the metanephric mesenchyme. However, differentiation and survival of the mesenchymal cells as well as their conversion into an epithelial lineage is controlled by inductive signals, such as growth factors and Wnt ligands that are secreted by the ureteric bud. Studies using mice embryos have demonstrated a role for Wnt9b, which is expressed on the stalk of the ureteric bud, in regulating mesenchymal-epithelial transition and the induction of renal vesicles by activating transcription factors such as Pax8 and downstream wnt targets such as Wnt4 in the metanephric mesenchyme . In addition to this reciprocal signaling between the ureteric bud and the mesenchyme, certain growth factors secreted by the ectoderm, such as bone morphogenetic protein-4 (BMP-4), have been shown to induce the expression of the earliest kidney specific markers, the transcription factors Pax-2 and Pax-4, in the intermediate mesoderm during mouse, frog, and zebrafish development. The intermediate mesodermal cells of mutant mouse embryos lacking both Pax-2 and Pax-8 expression failed to convert into an epithelial lineage that is essential for the formation of functional nephrons, and instead, underwent apoptosis at later time points . The transitioning of cells from a mesenchymal to an epithelial lineage is marked by changes in cell polarity, cell motility, cell-cell contact formation, cytoskeletal organization, and extracellular matrix composition. The expression of E-cadherin is upregulated in the epithelial phenotype, which mediates the formation of stable cell-cell contacts and maintains tissue integrity. In studies using mice and human somatic cells, exogenous E-cadherin expression was sufficient to overcome the requirement for the transcription factor Oct4 in the reprogramming of mouse fibroblasts into pluripotent stem cells , while depletion of E-cadherin led to impaired mesenchymal-epithelial transition in human somatic cells . In the developing mammalian kidney, type II cadherins such as cadherin-6, cadherin-11, and R-cadherin are also known to be dynamically expressed and play a vital role in regulating the conversion of the metanephric mesenchyme into an epithelial lineage. For instance, mutant mice embryos lacking cadherin-6 exhibited a delay in the conversion of metanephric mesenchyme to the epithelial phenotype, as well as delayed or disrupted fusion of the renal vesicle with the ureteric bud. This led to a number of non-functional nephrons that subsequently underwent necrosis during development, resulting in a decline in the nephron populations within the kidneys of adult mice . In addition to biochemical signaling, biophysical signals such as substrate topography and other mechanical properties of the cellular microenvironment also have a direct impact on the reprogramming ability of somatic cells. Growing cells on micro- and nano-patterned bioengineered substrates can introduce changes in actomyosin contractility, which can modify the cells’ epigenetic state by increasing histone acetylation and methylation levels in genes encoding for epithelial markers. This has led to improved efficiency in reprogramming somatic cells into induced pluripotent stem cells . A number of studies have also highlighted the regulatory effects of the Rho family of small GTPases, which are key modulators of cytoskeletal organization in response to mechanical signals, during mesenchymal-epithelial transitions. Maintaining correct levels of Rac1 is necessary to promote an epithelial lineage, while activated Cdc42 and RhoA led to cells adopting a mesenchymal lineage . How do mechanics regulate epithelial tube formation? The basic steps during tube formation, including cell polarization, the formation of small multiple lumens and the coalescence of multiple lumens into a single lumen, and subsequent tube elongation, are directly regulated by mechanical signals arising from neighbouring cells as well as the extracellular matrix. Read more..
How do mechanics regulate cardiac development? The various events during cardiac development are driven by mechanical signals sensed through cellular communication with its immediate environment, which include both the extracellular matrix as well as intercellular cell-cell contacts. Read more..
Cardiomyocytes are the chief cell type in the heart and their coordinated contraction as a mass is responsible for the pumping of blood around the developing embryo. Cardiac specification occurs very early on during embryonic development. Read more..
What are the morphogenetic events during cardiac development? The heart is derived from the splanchnic lateral mesoderm and initially forms as two crescent-shaped endocardial plates inside the evolving pericardial cavity. As the embryo undergoes lateral and cranial folding, the two plates come closer to each other and eventually fuse at the midline, forming a primordial cardiac tube. Read more..
What are the basic stages of cardiac development? The heart is the first functional organ to form during the development of an embryo, which, in humans, occurs during the third week post-fertilization. Read more..
How do mechanics regulate mesenchymal-epithelial transition? The transitioning of cells from a mesenchymal to an epithelial lineage is marked by changes in cell polarity, cell motility, cell-cell contact formation, cytoskeletal organization, and extracellular matrix composition. Read more..
What is mesenchymal to epithelial transition? During development, the transitioning of epithelial cells to a mesenchymal lineage is not an irreversible process. Instead, a number of developmental programs are accompanied by a reversal of EMT, during which the mesenchyme gets dedifferentiated into the epithelial lineage through a series of molecular events, known as mesenchymal to epithelial transition (MET). Read more..
How do mechanics regulate epithelial-mesenchymal transition? Mechanical signals, such as the rigidity of the cell’s microenvironment, play a role in the regulation of epithelial to mesenchymal transitions (EMT). Lee et al. observed that mammary epithelial cells underwent EMT when placed on hard substrates and treated with matrix metalloproteinase-3 (MMP3). This was not observed in cells grown on soft substrates. Read more..
What is epithelial to mesenchymal transition? Epithelial to mesenchymal transition (EMT) is the process whereby epithelial cells are transformed into mesenchymal cells. Epithelial cells form the epithelium tissue which covers the internal and external body surface of an organism. These cells are polarized and form extensive cell-cell adhesions, including adherens junctions and tight junctions, with each other. Read more..
What is the cellular origin of hematopoietic stem cells? Based on findings from a large number of anatomical, biochemical, and genetic studies carried out over the years, three major theories have been put forth to describe the cellular origin of hematopoietic stem cells: the hemangioblast theory, the hemogenic endothelium theory,and the mesodermal prehematopoietic precursor theory. Read more..
How is hematopoiesis regulated by mechanics? Once blood circulation is established during the earliest stages of hematopoiesis, the pulsatile nature of blood flow within the aorta generates a range of biomechanical forces, such as fluid shear stress, hydrodynamic pressure, and circumferential stress. A number of studies have shown that the hemodynamic environment within the blood vessels has a direct influence on the structural and functional characteristics of the endothelial cells lining the inner walls of the vascular tissue. Read more.. The hematopoietic system, which comprises all the cellular components of the blood, is one of the earliest organ systems to evolve during embryo development. Hematopoietic stem cells (HSCs), which are rare blood cells residing in the bone marrow of the adult organism, are the founder cells that give rise to the entire hematopoietic system. Read more..
How do mechanical forces drive the various stages in dorsal closure? A number of studies, which describe the cellular mechanisms and signaling pathways underlying dorsal closure, have pointed towards a mechanical basis for the morphogenetic changes associated with this process. It is now evident that a coordinated interplay of forces generated within the two major cell types involved, the lateral epithelial cells and the amnioserosal cells, is essential for driving the various stages in dorsal closure. Read more..
Dorsal closure is a well-defined moprhogenetic event that occurs during the early stages of Drosophila embryogenesis. It involves the closing of an elliptical gap at the dorsal midline of the embryo by the convergence and fusion of epithelial cell sheets on either side of the embryo. 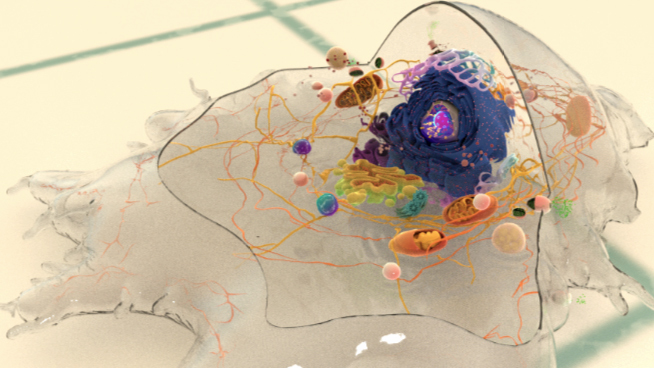 Read more..
How does the cytoskeleton contribute to cell and tissue polarity? As well as the asymmetric organization of cellular components, polarity can also be defined through the structural orientation of the cytoskeleton, in particular filaments and microtubules. This is important in cell migration and motility, which requires a front-rear polarity in order to determine the direction of movement. Read more..
How are proteins and lipids segregated during polarization? In polarized epithelial cells, the apical membrane is rich in PIP2 and houses the PAR and Crumbs polarity complexes while the basal membrane contains PIP3 and the Scribble polarity complex. Read more.. Cell polarity refers to the intrinsic asymmetry observed in cells, either in their shape, structure, or organization of cellular components. Most epithelial cells, migrating cells and developing cells require some form of cell polarity for their function. Read more..
How are epithelial tubes formed? Depending on whether the tubular organs are formed from already polarized cells or they require de novo polarization of cells, cellular organization during tubulogenesis can be categorized into one of these five general mechanisms: wrapping, budding, cavitation, cord hollowing, and cell hollowing. Read more..
Tubulogenesis, or the formation of tubes, is one of the fundamental morphogenetic events taking place during development. Several major organs, such as the respiratory, circulatory, and secretory systems, are constituted by an interconnected network of tubes. Read more..
How are developmental processes regulated by mechanical signals? Development in higher order organisms commences at conception and continues into old age. With every stage of development, changes in the physical properties of cells and tissues. In some cases these changes result from fluctuations in the biochemical or metabolic activity of cells, however in other cases, changes in the physical microenvironment drive the biochemical and genomic changes within cells. Read more..
What is the epithelial to mesenchymal transition (EMT)?